Boredom and children are not an intriguing mix. If your kids show signs of being bored and restless this summer, why not interest them in some fun crafts projects? You'll lose their interest if you sit them down to make embroidered doilies or a crocheted toilet seat cover for Gran. Instead, let them make items they'll have fun using! Sequined Saucer. Cut out the middle bit of two hard plastic plates. If you can find coloured plates, all the better. Fill up a plastic seal-tight bag with sequins. Staple the plates together around the edges, with the plastic bag in the middle, so the sequins are visible. You can staple more plates to add additional weight if wished. Styrofoam Frisbee. Get a styrofoam plate and cup. Put cup in middle of plate and trace around it. Cut out the circle and place cup inside, so it remains wedged in the middle of the plate. Decorate plate with pens and you have a weighted frisbee that's ready to fly. Custom Design. 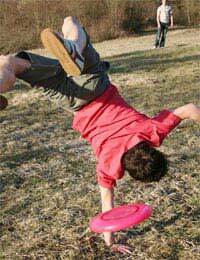 For older kids who want more of a cool custom-designed frisbee, there are many on-line sites which charge a small fee to have your own logo printed on the frisbee front. Why have a skipping rope that is virtually indistinguishable from everyone else's? Help your children's ropes stand out! Beaded Bounty. Buy a thin rope or durable piece of string, determine the length you need and string with rectangular wooden beads. Add handles after you string, making sure you leave enough string or rope on the ends to tie a strong knot. This will give you a durable, heavy-duty rope that is good for cold weather. Make sure, however, that the beads you choose won't crumble or damage easily when they hit the ground. Hardware Heaven. Buy an 8 to 10 foot (depending on height of child) braided polyester rope, two steel washers and and one-foot long ½ inch PVC pipe from your local DIY store. Ask the store to cut the pipe in half, or have an adult do it. Thread the rope through the pipes, or handles, add a washer then tie a strong knot in the end. You can wrap ends in masking tape as a precaution against fraying. This rope will last! Kit It Out. Look online for skipping rope kits that will allow you to make your own. Often these involve elastic bands or weaving, but the nice thing about kits is that they usually come with quality wooden handles – and complete instructions. Fuzzy Ones. Buy at least seven yards fuzzy wool in a colour that will enhance your flip flops. Tie around one end of flip flop, as close to sole as is humanly possible. Weave around strap so that none of strap is visible. Leave some at the end, about three inches, which you can weave underneath the wool with a tapestry needle. Bring on the Bling. Buy self-adhesive jewels, glue on to flip-flops. Much cheaper than buying custom-made jewels for Crocs – and you can peel off and change the bling to match your outfit whenever you wish. Feather Fun. This one is sure to tickle your toes! Buy feather boa in bright colour from a craft shop. The, starting at one end of the flip-flop, poke the boa into the sole where it attaches to the strap. Glue across the entire strap, but leave an end to poke into the sole. A quick way to make stylish flip-flops! Making fun craft projects is something both girls and boys enjoy – if they make things they like. Your children will love making these unusual projects this summer, and you'll love the fact they are keeping busy and entertained – away from the computer and telly!